INCORS GmbH is proud to present the Alloy Look and Feel, a new generation look and feel for Java™ Swing applications. The Alloy Look and Feel enables developers to dramatically improve the user interfaces of Swing applications with minimal effort. With its unmatched appearance, an outstanding active feel, extensive functionality, and high performance there finally is a Java™ look and feel that closes the gap to the latest native GUIs without sacrificing performance or functionality. Version 1.4.4 has been released. This is a bugfix version, which fixes some bugs of the previous release. The complete change history can be found here. Take a look at the screenshots or request a 30-day evaluation license to try the Alloy Look and Feel's capabilities. 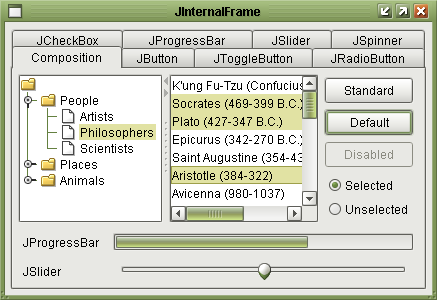 Below is a screenshot of a demo application using the Alloy Look and Feel. The displayed theme, called "Acid Theme", is one out of four ready-made themes that come bundled with the Alloy Look&Feel. The glow effects on the scrollbar, that make it look like translucent plastic, are somewhat unusual but gives the theme an interesting and friendly touch. Reload this page to see a different theme.